Aquarius is a fascinating zodiac sign, and the symbols attached to it can inspire some very creative tattoos. If you happen to be an Aquarius yourself, you might want to consider a few design ideas for some personal body art. 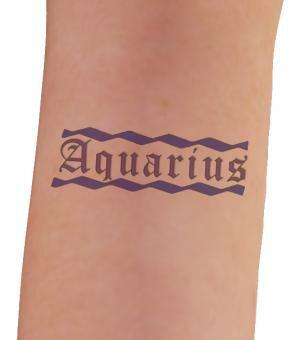 If someone you love is an Aquarius, you might even consider getting one of these tattoos in his or her honor. Aquarius is symbolized as the water bearer, and there are numerous design ideas you can draw from this classic imagery. 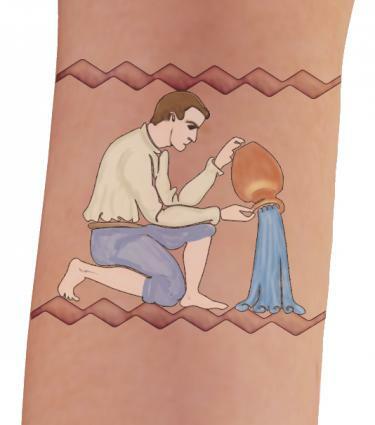 Go with the classic design of a man or woman pouring water from a jug. Consider getting a black silhouette of a water carrier with a colorful rainbow of water pouring from the jug. As an alternative, you could pose your water bearer shouldering a long pole with a bucket on either side. You could honor a loved one by making that person your water bearer. If you're looking for something a little edgier, consider replacing the traditional water bearer with a pinup girl pouring water from a jug instead. If you prefer, skip the water bearer character altogether and just go with water pouring from a jug, perhaps with the water running gracefully down one of your shoulders. 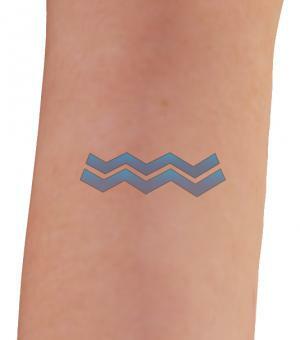 Another favorite Aquarius tattoo includes using this sign's glyph symbol, which is two perpendicular wavy lines. The glyph is often incorporated in larger designs. You might a series of glyphs arranged into the shape of a water drop to connect with the idea of the water bearer. Your tattoo artist could ink a chain of glyphs around your wrist like a bracelet. You might also choose a design that incorporates your Aquarius glyph with the glyph of your significant other's zodiac sign, such as a Pisces fish jumping up between the waves of your glyph. Have your glyph inked in tribal style. A rich assortment of flowers and other plants are associated with this sign. If you want to create a tattoo that's related to your sun sign, but not in a completely obvious manner, you could try designing a tattoo using some of the following flora. Bird of paradise - Few things in nature look quite as dramatic as this unusual tropical flower. It literally looks like a bird in flight. Orchids - It's difficult to match the diversity found in the world of orchids, and there are literally thousands of species. The colors are unbelievable, and the shapes are fantastical. Goldenrod - Think fluffy sprays of gold. Dandelions - Remember, one man's weed is another man's wildflower. Of course, if you have no interest in beating around the bush, you can get straight to the point with a lettered tattoo that proclaims to the world that you are an Aquarius and proud of it. Aquarius spelled in a nice flowing script seems to best reflect the essential character of this sign, but be sure to go with a style that feels right to you. Although there's a lot of water imagery connected to this sign, Aquarius' element is actually air. Consider spelling out the name in a windswept or swirling script. Turquoise is Aquarius' star stone, so you might like to have your tat spelled out in turquoise-colored ink. If you're not sure of the exact design you want, or you can't find a good image to convey your ideas, let your tattoo artist create a sketch for you. You can approve the design if you love it, or you can ask the artist to make changes before you commit to the ink. In the end, you'll wind up with an original work of body art you can enjoy throughout your life.